Like Merchant Ships: CSA Produce: Worth The Cost? CSA Produce: Worth The Cost? In February, I invested in 1 CSA share at a local farm. The cost works out to $15 per week for 28 weeks. Would I have saved money elsewhere? Would our kids even eat the vegetables? This was a leap of faith for our family. After 2 weeks, I know we made the right choice! Despite twice daily salads, we still have more mesclun than we can eat. The kids are munching spinach right along with me--and asking for more. Secret plan to broaden family eating habits? Check! Right now we're enjoying local, organically grown fruits and veggies along with pastured meats and eggs from our farmer's market. The market lasts until November and I'm thinking of joining one of the CSAs here for the winter months. Glad it's working out well for your family! Use some of that spinach for green smoothies. My kids love them! I wish we had a CSA nearby. Today though we're going to the grand-opening of our farmer's market. I think the kids will enjoy it and hopefully be willing to try a few "new" things. Yeah for your kids! I am going to show some of my "reluctant eaters" this post as encouragement!! Looks like it was absolutely worth it. We have a few of these, but not nearby. Our state Farmer's Market is close as is H Mart. Both have great deals and even if they weren't, we do often spend a bit more for good produce. Yum! We love spinach. Everything else looks great too. CSA is short for Community Supported Agriculture. You pay for a share in a local farm, much the same way as you would buy a share of stock. One share entitles you to a set amount of produce per week. Usually the produce is organic or uncertified organic. Each CSA works a little differently. Some include eggs and meat. Most CSAs have a pickup day once a week where you go and pick up your basket of produce. In ours, a share = 1/4 bushel. Joining would not be worth it to us if I had to drive across town with all 3 kids for pickup. So, when I found a CSA that delivers to a central point in my area, I joined. Susan, I couldn't believe my eyes when my broccoli-and-apples-only picky eater tried every one of the vegetables last week. The clouds parted, the sun shone down, and a choir of angels sang Hallelujah in this house. We have a couple CSAs nearby, but they're so expensive. Can you believe that they want $30 to $40 per dropoff? There's just no way when my family eats about $15 worth of produce from the local produce stand every week instead. As much as I want to support the little farms in the area, I can't justify spending twice as much to do it. we have gone on and off of CSAs. we live in the mecca of fresh, local produce. i love supporting local agriculture and eating fresh and organically. love it! but once on a CSA for awhile, at least with young kids, it can get kind of rough (even in the fresh food mecca we are in) to eat kale week after week after week. i would recommend it to everyone, though, simply because (aside from the earth friendly reasons) it is a fantastic lesson in seasonal foods and learning to cook new recipes. I looked into it last year, and it seemed expensive, but since watching the documentary "The Future of Food" (free on Hulu.com) I am MUCH more interested in knowing where my food comes from, since genetically modified ingredients aren't labeled on nutrition facts (and they haven't been tested!) So, CSA seems like an awesome idea. Fortunately, there are many more CSAs to choose from than when I first started looking 2 years ago. If you find one like ours, which is no longer organically certified but uses organic practices, the price is less. CSAs are all around us! Wow! That's a deal! I looked into a CSA a couple of years ago. We were going to split it with another childless couple. I think it was $200 for only 10 weeks or so. Fifteen dollars a week is a really good price for all that food! I so wish we could have done that this year...This is 3rd year straight I've tried to get hubs on board only to be told it would be cheaper to get produce from the store. My argument: I would broading our cooking style with the added benefit of having our family eat healthier! I will send him your post!!! I've been going back and forth on this, glad it's working out for you! I did a CSA thingie for organic milk for a while, but the hour round trip every Thursday afternoon wasn't working for me any more. I do love supporting local farmers, though, and plan to visit the farmer's market often this summer. 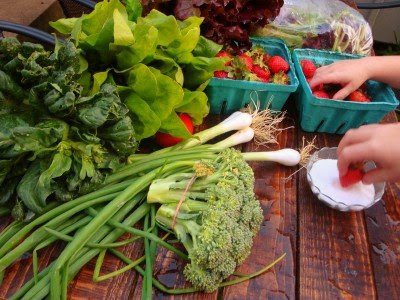 Our first CSA pickup of the year is this Saturday and I can't wait. This is our second year and I just love the farm we're with. $15 is a bang up price. Is that a full share? I'll be posting my CSA menu plan and recipes as the season goes. I hope you will be doing some of the same! I never found a way to get my kids to eat beets! I love our CSA too. We get a box every other week for $31.50 that usually has 10 items in it, i.e. 1 item is a a head of kale, or 2 lbs of apples or 1 pint of strawberries. When I get mixed fruit & veg it carries us about nine days so I fill in elsewhere. It's an unusual CSA in that you can choose from their farm only or to to include from other suppliers regionally and the rest of the West Coast. Sarah M--my husband isn't too enthusiastic about the cost of the CSA but I tell him it's what keeps me excited about cooking, and even though it would be cheaper to buy loss leaders only it's not as expensive as buying the whole box at Safeway, much less Whole Foods. So far my picky child eater hasn't tried much new, but my picky adult eater (dh) has so hopefully the example will rub off eventually. I've been following your blog for a few weeks now. Are you in the South or sunny Cal.? No strawberries here in NJ yet, but the local spinach is starting to show up. I wish I could join a CSA, but there's too much driving involved. This is still called the "Garden State," but now the "Suburban Sprawl State" would be more accurate. A shame, because it's great farming country. We make do with the remaining farmstands and farmers market, and the local premium vegetable/gourmet store that still carries, and labels, NJ produce. We had that where we use to live...and it was WONDERFUL! I've been interested in a CSA share for awhile but those in our area were quite expensive plus a long drive which just wasn't practical for a weekly drive. After reading your comment about finding new ones in your area recently, I decided to check again and sure enough, there is now a farm with CSA shares not far from here! It looks like it might be a good fit, location and price-wise. I've emailed them for more information. Yeah! whats a CSA???? hook me up!!!! We just finished our first CSA run and decided not to do it this next year ... one it's a full year and we are trying to simplify for next year (and that's one less stop for me), and two, the CSA we used grew very unusual food. We loved some of the stuff, but got so many odd and unusual vegetables that the kids wouldn't eat (nor my husband) that it wasn't worth it. Glad you are having such a great experience ... I'm hoping to try again in a few years! Check back again after our 8th week of chard! I'll be sure to update as the summer progresses. For now, we're delighted. I'm mostly doing the CSA for me. I know I will cook and eat the vegetables so they don't get wasted. If that's a fail-safe way for mom to eat healthy, then it works for me! We tried that route last year, but unfortunately we weren't happy with the results. The farm was in its first year and lost many crops to bugs, pests and drought. Ugh! Saddled with that we got some things we don't eat (radishes, anyone?) and we felt we didn't get our money's worth. This year, the prices increased a lot ($150 per share) so we knew we couldn't afford to join again, even though we love the idea of organic, local produce and keeping our money in the community. So, we'll be buying from the Farmer's Market each week - and our CSA farmer even sells his extra there, so I hope to buy from him as often as I can. Mmmm..those fruits and veggies look delicious! Great price too! I checked our CSA and it was around $25-$30 a week...a little more than I wanted to pay. We did just pick up over 250 lbs of local pasture-raised beef and pork. Sooooo excited! Becky, here is a recipe for chocolate beet cake....a way to get some beets into your kids. ha! My sis makes this and loves it! (I don't know if this is the same recipe but it looks pretty darn good). I can't wait to try it! Don't worry Meredith, come the heat of the summer, you'll see less greens I'm sure and more summer squash than you can shake a stick at! Don't forget folks, there's a large cost to the farmer to get that produce packed for each share and delivered, especially if it's right to your door. Especially if it's a small farmer, and most CSA's are fairly small. There's a big difference in costs and CSA share price depending on how each farm does it. And they're popular enough that many inexperienced farmers are giving it a whirl so you may find a dud from time to time-- some worth riding out, sometimes not. Bless every one of you who triesit and loves it-- from a former CSA farmer---before it was popular.